Leap is a completely free, 10-week weight management programme for adults in Leicestershire. If you are fed up of dieting, then this programme is for you. It combines nutrition, led by a registered dietitian, with structured exercise with an activity instructor. 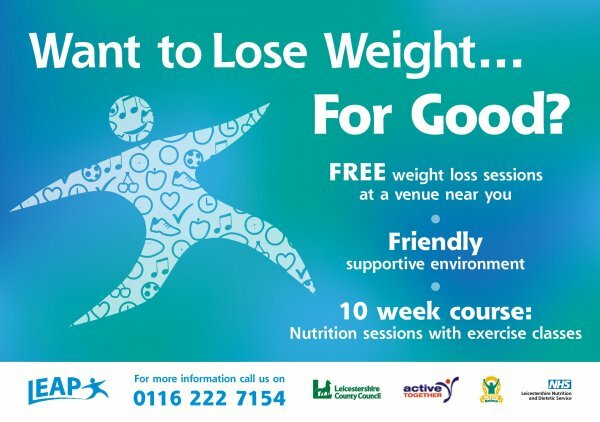 We have already helped hundreds of people in Charnwood develop the tools they need to lead a healthier lifestyle and lose weight. Leap sessions are delivered quarterly with four ten week sessions being delivered throughout the year. You can either chose from an afternoon session in Thurmaston or an evening session in Loughborough. Courses are very popular in demand so early booking is recommended. To book your place please call 0116 222 7154.